The phrase “Never Again” is generally associated with the Holocaust, the Nazi German state’s planned and executed genocide against the Jewish people. The aim of Nazi Germany in World War II was simple and horrific – eradicating Jews from the human race. That meant obliterating their past history, their then-current existence, and future continuity. The origin of “Never Again” and its connection to the Holocaust is historically unclear. But Cameron Kasky, a junior at Marjory Stoneman Douglas High School in Parkland, Florida, who is Jewish, is credited with adopting #NeverAgainMSD (Marjory Stoneman Douglas) as the hashtag that helped to mobilize student protests for sensible gun reform, which we saw again yesterday. Kasky, and several other student leaders have been relentless in their commitment to change. Their goal is also simple: they want to know that they and other school students in the U.S. can walk into their classrooms without having to fear that they might be the next victims of a mass shooting. Does it matter that a specific phrase, applied to a certain people, at a certain time, has taken on renewed and reinterpreted meaning? I think that it’s not only a powerful and brilliant adaptation of the phrase but one that none other than Elie Wiesel, the late Nobel Peace Prize winner, who was often associated with this phrase, would approve of. While Elie Wiesel was the chronicler par excellence of the Holocaust and gave personal and collective voice to its Jewish victims unlike any other literary figure of the last Century, he also spoke out against genocide in countries like Sudan and spoke for victims of violence throughout the world. His personal experience compelled him to speak on behalf of those who could not, regardless of their background. “Forgive me. I’m just back from Sarajevo,” he said, pushing the papers aside. He told the audience about the devastating effects of the Bosnian conflict — the mass killings, the destruction of Muslim sacred sites, the cold-blooded murder of thousands of children. “I cannot put that place out of my mind. It has robbed me of my sleep.” He turned to Bill Clinton, seated on the dais behind him. “Mr. President. You must do something.” It was too much for Wiesel to stand at the opening of the U.S. Holocaust Memorial Museum, that embodied the promise “Never Again,” while the scenes of the mass killings that he had just seen again were haunting him. And those words made a difference. Eventually, President Clinton led the effort to involve NATO in ending the deliberate bombing of innocent civilians during the Kosovo War. And for those who are cynical about the possibility of reform, it seems fitting to remember the words of another Nobel prize winner, this time in physics, Stephen Hawking’s, who died yesterday. He once said, “Remember to look up at the stars and not down at your feet. Try to make sense of what you see and wonder about what makes the universe exist. Be curious. And however difficult life may seem, there is always something you can do and succeed at. 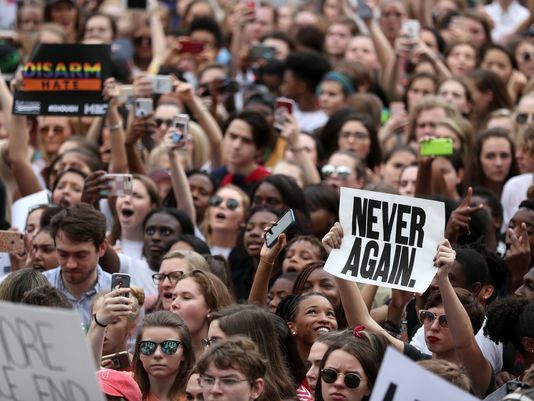 NeveragainMSD, Never Again anywhere, is a reminder to politicians that these students, and many adults, are not giving up this time.